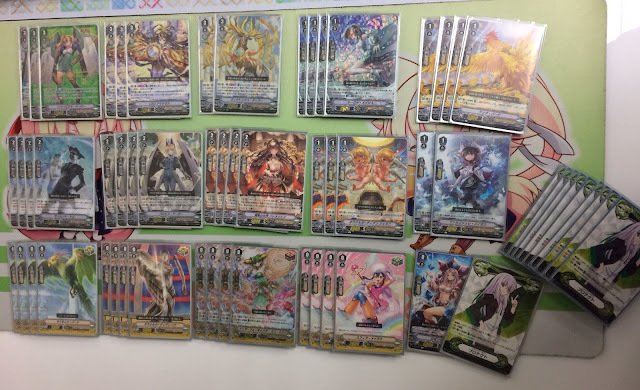 The Oita branch of Japanese card shop Card Place uploaded the final games from its two Standard-format unofficial shop tournaments, both held on May 26th, 2018. These videos are the first tournament videos of the Standard format, although they are best-of-one. The above video features Kanari (left) playing Kagerо̄ versus Gamarin (right) playing Oracle Think Tank, while the video below covers Kawanobe (left) playing Royal Paladin versus Shuugo (right) playing Kagerо̄. Decklists are at the bottom of the page. Of note is that despite otherwise playing the game well, Gamarin misunderstands Imperial Daughter's on-ride skill at the 11:46 mark, looking at the top 2 cards of the deck and adding one card to soul and stacking one on top of the deck. In reality, Imperial Daughter adds one of those cards to hand and the other to either soul or top of deck, so he should have put the Gemini into his hand rather than to soul. It ultimately doesn't change much because of the game ending shortly thereafter--he soulblasts the Gemini as part of Luck Bird's cost, but could have blasted any of the other 4 for the cost even if Gemini weren't in soul. In this match, Gamarin hits all of the major beats of his deck; he rides Circle Magus, opens on Amaterasu so he has an overall lead in card advantage throughout, then transitions to Imperial Daughter for his endgame. Meanwhile Kanari is hurt both by having to G Assist to grade 3 and by how Gamarin's units counter his own plays. Promise Daughter's inability to be retired for the opponent's card effects stops Kanari cold on his grade 3 turn, as it blocks Waterfall's on-ride skill, and the turn before that Promise Daughter's +6k forced Kanari to take a damage he clearly didn't want, giving the lead to Gamarin. Because he can't retire anything with Waterfall, Kanari's Gabiya column becomes just 15k rather than 25, and his Raopia 8 instead of 13, preventing him from poking with Raopia and then forcing a damage with Gabiya. Kanari failing to ride Overlord deprives him of his midgame and makes him waste a ride on a vanilla Force turn that doesn't develop his overall strategy, putting him in a significantly worse position. For Gamarin's part, successfully powering up CEO three times with Farfalle and her own skill pushes his opponent to go to 5 first, while also stacking a crit on top with Farfalle that almost ends the game outright. Silent Tom ends up only swinging for 37 vs a 33k vanguard, but it still forces a 15k shield because of Tom's effect blocking normal unit guardians, wasting Kanari's resources. For the finale Gamarin chooses to let Dragonic Overlord hit when could easily stopped the first swing, so that Kanari would discard 2 cards for a single drive check and reduce his own hand size. In general, Kanari seemed less familiar with his opponent's card effects going into the match than Gamarin was with his; he didn't know Imperial Daughter couldn't be retired, nor about her power gain, both things which cost him early on. He also chose to snipe a Tom with Berserk Dragon rather than one of the boosters, when already-called Toms are mostly dead in Standard for only hitting 17k on their own. For Kawanobe versus Shuugo, Kawanobe's hand doesn't let him hit the ideal Royal rides, forcing him to open on Soul Saver Dragon and be put in the unusual position of transitioning from SSD to King of Knights after using his Holy Charging Roar turn to force Shuugo to 5. Meanwhile Shuugo begins with the intended open of Dragonic Overlord and forces Kawanobe to perfect guard early with Overlord's 31k on-hit pressure, but misplays by first calling a rearguard Dragonic Overlord and attacking with it. In the first place, calling that Overlord is the reason he's unable to get another Force Gift on the next turn as it would be too early to ride Waterfall even if he had it, and he doesn't have a third Overlord waiting in hand to ride. Second, Shuugo saw his opponent drive check a Draw Trigger perfect guard back on Kawanobe's first turn and should have anticipated Overlord being guarded. Swinging with the vanguard first would let him put the crit on the rearguard, potentially evening the pace of damage. Akane ensures Kawanobe can hit his target soul count by turn 4, and a second Akane in hand actually opened the possibility of a Holy Charging Roar on the first ride at the 3 minute mark. Kawanobe rightfully held back until his opponent was at a damage count where the 30k power boost would matter, choosing to play conservatively because going second already gave him the damage lead he needed and Shuugo wasn't doing anything to outpace him. This second Akane proves pivotal in enabling him to get off a Roar in the same turn he later used Blaster Blade. Shuugo makes an interesting play at the 9:55 mark: he attacks a rearguard with Spillover Dragon to power up Bellicosity mid-battle phase, taking out an interceptor and drawing more shield out of Kawanobe. He could have called a booster for Spillover to use its end-of-battle skill and guarantee the retire, but instead played on his opponent not expecting the move while saving himself a 5k shield and counterblast. Ultimately what does Shuugo in is that Kawanobe is able to scale his field appropriately to set up both Jauron and Blaster Blade as overwhelmingly powerful beaters that stretch Shuugo's hand to its limits when he's already back-to-the-wall at 5 damage. 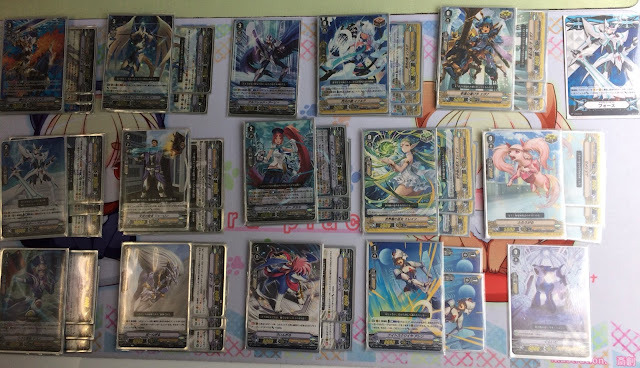 Jauron gets 5k on-attack which makes a 23 column with Pongal and jumps up to 33k with Force, already making Shuugo guard with a Heal and one card more, and Blaster Blade similarly received 5k from King of Knights' skill and a 13k boost from Wingal for 28 total. Kawanobe's trigger checks push Shuugo beyond the threshold he can guard with that turn, making 43 and 38k columns. The match opened with Kawanobe playing offense, and it ended that way. Gamarin's Oracle Think Tank decklist. Compare and contrast Soga Hiroshi's Oracle list. Note the differences with Uchida's list. Jauron instead of Conjurer, tech Alfred Early, valuing Wingal over a 12th grade 2.